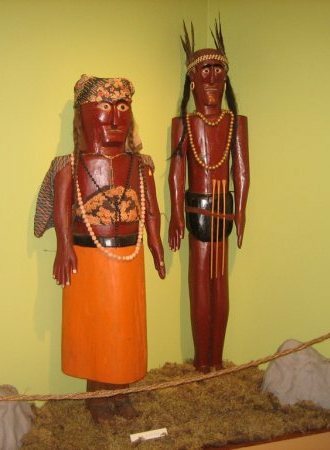 In the late fall of 2013 I was contracted by the Windsor Community Museum to produce documentation and an appraisal of a large collection of folk art by an Essex County man named George June. The museum put the work on display for a couple of months, and I believe much of it is still available for viewing. It is interesting work. Much of it quite simple, but elegant in line and form. 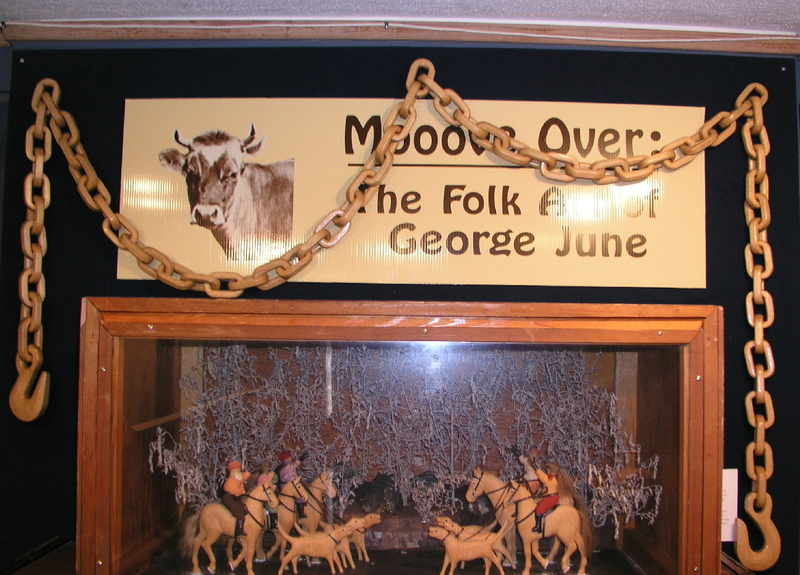 Mr. June created jewelry, canes, costumes, furniture, carvings of animals, people , and objects, along with carved and assembled vignettes of everyday rural life. All with fine attention to detail. Culminating in two extraordinary marquetry tables. George Forester June lived in Cottam, Ontario, a small town in Essex County. A retired farmer, he was afflicted with sciatic rheumatism in 1929 from which he only partially recovered. Used to working with his hands and keeping busy, he was in search of a hobby. At his cottage near Lake Couchiching he first whittled a cedar cane. It was the beginning of a hobby that would last the rest of his life. He continued his hobby at his home in Cottam. 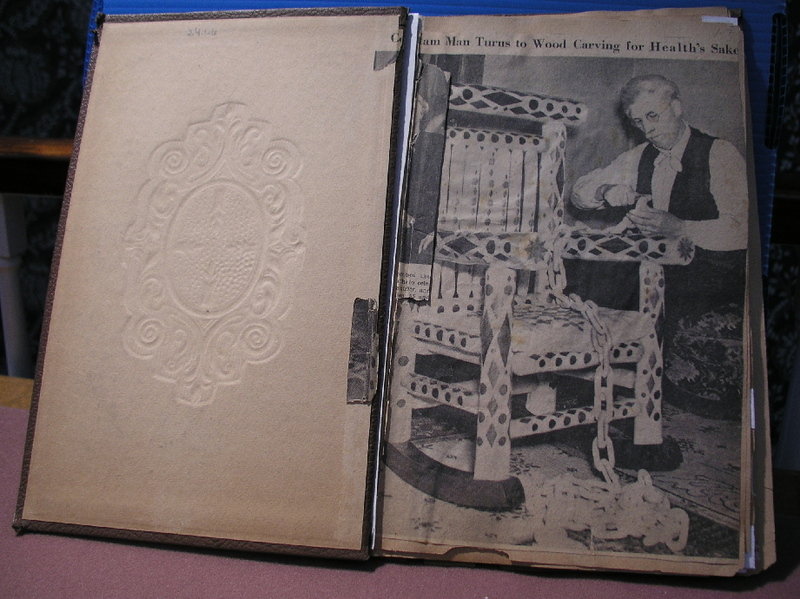 While his wife, Elizabeth, worked on her hooked rugs, he would shape wood pieces into works of art. Soon these items became an attraction for residents and visitors to Cottam. He built a log cabin to house the pieces and invited people in to view them. Residents and family members recall that the large front room was filled with carvings he had made. Upon his death in 1944, Mr. June’s collection of carvings and his log cabin were passed onto his grandson George H. Coote. While raising a young family, George H. and his wife Mary began to look for a more permanent home for the collection. They approached local Museums in their own area without success. At the same time Huron County Museum founder, J. H. Neill, was collecting items to expand his own collection. 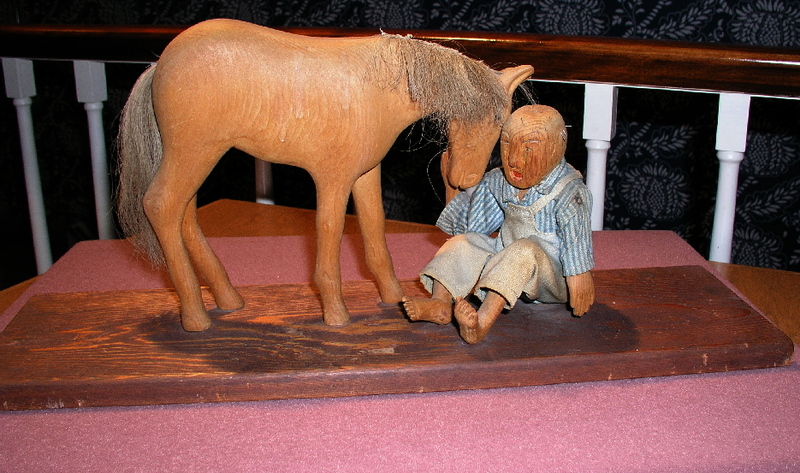 Mr. Neill approached the family and in 1956 Mr. June’s collection was loaned to the Huron County Museum. 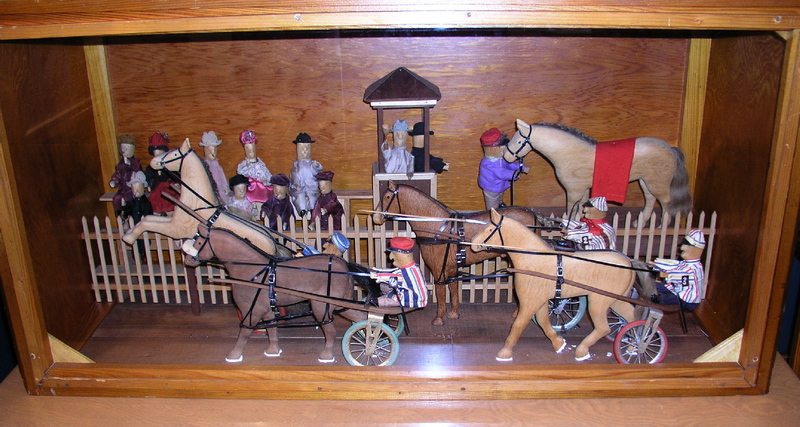 In 1986 the collection of folk art was officially donated by George H. Coote. Here is a description of the tables. 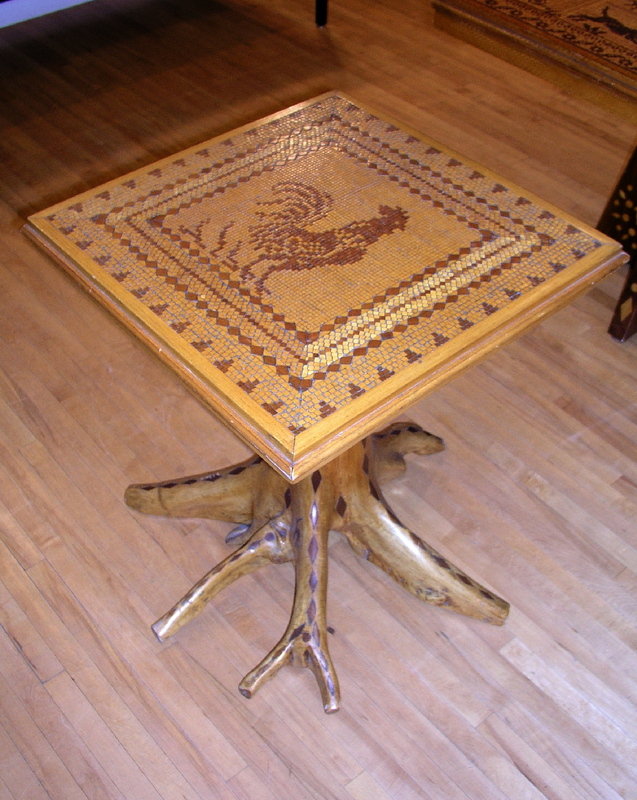 Made of walnut and white pine, this tabletop is made of 6000 pieces of 1/4 inch wood cubes. These types of wood were chosen because they have little shrinkage and would therefore last a greater length of time. The pattern was conceived by Mr. June and then drawn out on paper. It took approximately 3 months to carve and lay the pieces. 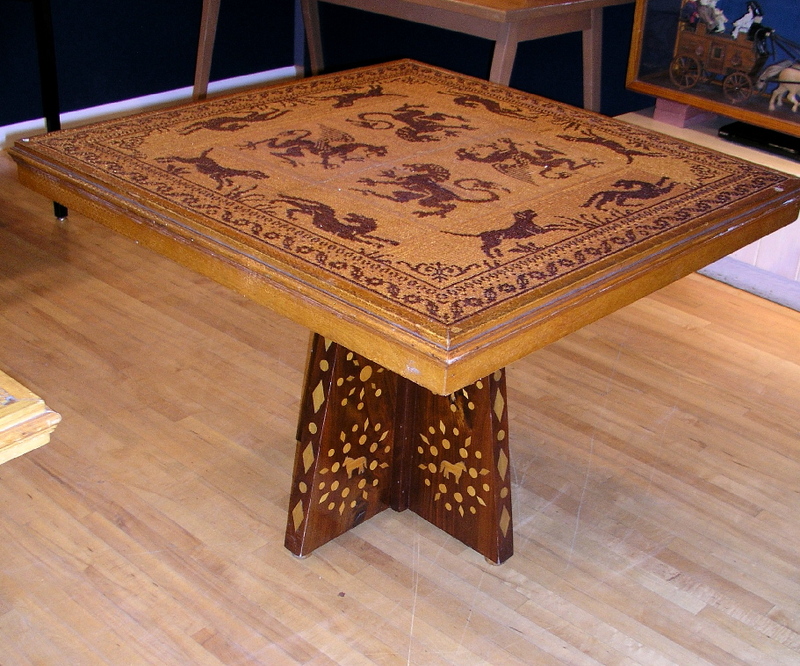 Mr. June spent approximately 6 months creating this inlaid table. It is made from 52,600 cubes of walnut and white pine which are laid onto an oak tabletop. If you get to the Windsor area, I highly recommend stopping by and seeing this work. They also have quite a bit of supporting information like his old scrap book. I don’t know how much of the work is easily accessible but I would think if you contacted them beforehand and explained your interest, they would be helpful. I enjoyed my time there, and their hospitality. I gave a folk art lecture one night and was delighted to meet the local collectors. They are a nice bunch of folks. Documenting collections is one of my favourite activities because it gives me a chance to look closely at the work, and get to know something about the artist. I enjoyed getting to know the work of Mr. June, and it is satisfying that it has been preserved in perpetuity by the museum for future generations to experience. This entry was posted in Canadian folk artists, Historical folk art, Ontario folk art and tagged Canadian folk art, Canadian folk artist, collecting folk art, folk art animals, folk art value, George June, Windsor, Windsor museum by shadflyguy. Bookmark the permalink.